What a fabulous trip we had to Madrid and Barcelona! Over the next few weeks I will be sharing with you the highlights. I dragged my husband to many museums in both cities (more about that later), but the Sorolla Museum, a hidden gem, was my favorite. Joaquin Sorolla (1863-1923), was considered to be one of the major Spanish painters of his time. When he passed away, his widow, Clothilde, bequeathed his estate to the Spanish government and asked them to turn their home into a museum and to feature her husband’s work. When you arrive, the gardens surrounding the museum are works of art. 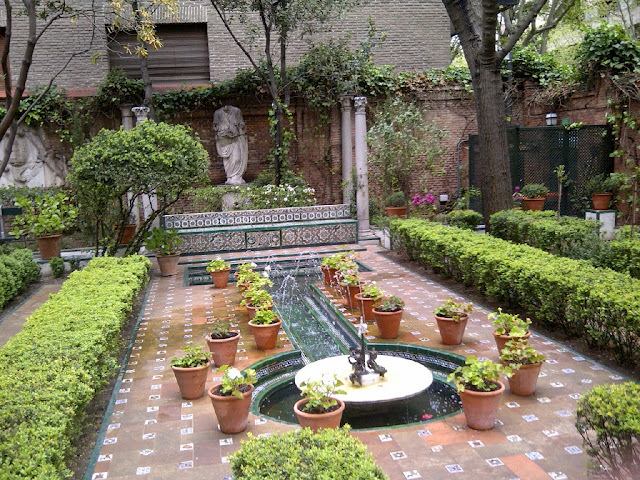 Surrounding the home are amazing greenery and flowers in the Alhambra style. When you enter the villa, one of the first things you experience is the love that Sorolla had for his wife and muse, Clothilde. Portraits abound of her and their children and there is a special temporary exhibit entitled, “Clothilde” running through October of 2012. 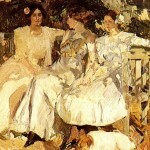 As the New York Times mentioned in 1909, during an exhibition in New York where Sorolla exhibited 356 paintings and sold 195 of these paintings before departing the United States, they named him “the Spanish painter of sunlight and color.” This characteristics of his painting style is so true. He continuously looked for new ways to paint people and objects and often painted them outdoors. When his gardens matured, he used them more and more often in his portraits of friends and family. 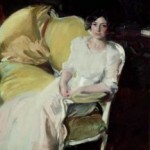 Joaquin Sorolla ‘s work is represented in museums throughout Spain, Europe and America, including the J. Paul Getty Museum in California. If you have the opportunity, please see his amazing paintings. Thanks so much for this post! I am hoping to get to Spain in the next couple years and I didn’t know about this museum. 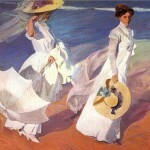 I love Sorolla’s work. Call if you get to the Cape. The shop is closed, but I’d love to see you! It’s great to hear from you! Spain was amazing. I probably will be going down to the Cape in August and I will give you a call before. Have a great summer.